Flies and gnats have invaded my worm farm. Please find pictures attached. You have recommended elsewhere in the forum reducing the amount of moisture in the bin to address this issue. To provide some background, I poured 2 litres of water into the bin in November to address an ant infestation that had occurred, which soaked the soil and food scraps. This moisture rectified the ant infestation, although was most likely the source of attraction for the flies/gnats (which appear to thrive in the very moist conditions). I have added limited water since, although the gnats have still stuck around (and multiplied) for over a month. I have also added agricultural lime (agricultural limestone/garden lime) to shredded newspaper and dried grass to reduce acidity (which attracts the flies) while also soaking up moisture. However, despite these steps, and no matter how many times I clean the gnats out (simply taking a wet cloth and wiping all the sides), there are always many more within a day or two. Accordingly, when providing a solution, please advise on a permanent solution that also eliminates the daily reappearance of these eggs and insects. It also seems that the fact that the bin is not airtight means that the problem may reoccur frequently in future, even if I manage to clear this initial problem. Please advise on how to prevent infestations from reoccurring in future. 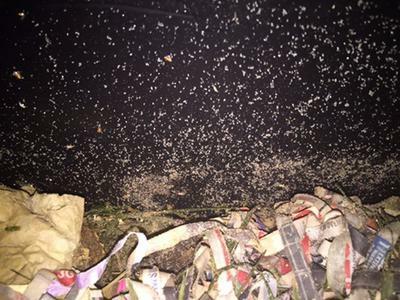 thank you for the pictures you sent through and the detailed description of your worm bin problem. Having had a look at the pictures I can clearly see that your worm farm is infested with a large number of critters. Due to the fact that it is not possible to properly identify the creatures in your pictures I am not sure that they are in fact maggots of gnats. In every worm farm there are usually many different critters actively involved in breaking down the organic matter that can be found in the bin. Many of them like molds, fungi, millipedes, actinomycetes, bacteria, millipedes, springtails and their close cousins collembola are supporting the worms in the worm farm by actively feeding on the decomposing organic materials. While some of those recycling agents in your worm bin are to small to see with the naked eye others like mites, springtails and collembolas can be seen as tiny dots on the surface and the walls of a worm bin. They are quite often living in great numbers inside a worm bin if the conditions are right and can be welcomed and just left alone doing their jobs. Mites and gnats can however become a nuisance and their numbers to large for the worm farm to work well anymore. Looking at the sizes and colors of the creatures in your pictures I believe that the pale brown critters could be mites and the tiny white ones springtails and collembolas. Leave the springtails and collembolas alone they will benefit your worm bin. Mites get attracted by very wet worm bedding, moist and sweet food like watermelon, potatoes and too much food in the worm bin. 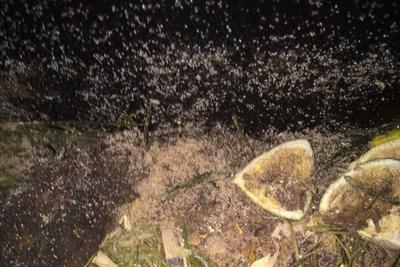 If a mite colony in a worm bin has become to large in number there is a good way to reduce their numbers. Place either some pieces of watermelon rinds or wet old newspapers on the surface of the worm bin and leave them there for 24 hours. When you check your worm bin again you will find large numbers of mites on either the newspaper or the watermelon rinds. Remove them, wash the mites off with water and place the newspaper or watermelon back into the worm bin. Repeat this for about 2 weeks and you will remove large amounts of mites from your worm bin. To reduce the gnats in your worm bin it is a good idea to properly microwave all the fruit and vegetable waste you want to add to your bin to kill all eggs of fruit flies and gnats. Placing the waste for a couple of days in the freezer will accomplish the same. To reduce the gnats and maggots that are already in your worm bin you could introduce Roundworms (Nematodes) to your worm farm. There should actually already some of them in your bin but adding additional ones cant harm your worm bin and they will actively prey on the gnat maggots. To add nematodes and other beneficial microorganisms to your worm bin you could brew some heavily aerated compost tea and add it to your worm bin. In order to know what to do to get your worm farm into a good shape it is important to properly identify the creatures that are living in your bin. For some more information about the kind of organisms you might find in your worm bin check out the following 2 articles. I am sure you will get the problem under control Marc.